The online retailer will be offering discounts across various electronic categories like smartphones, headphones, power banks and more. 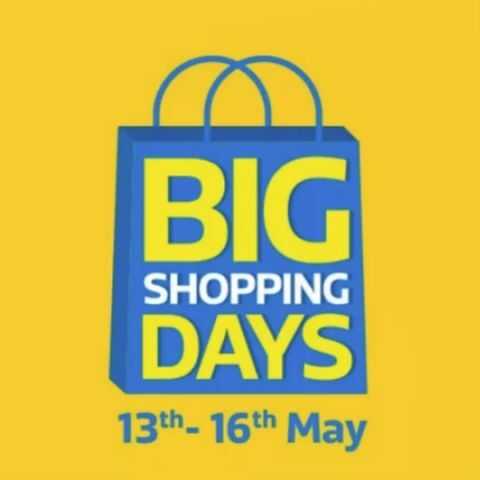 Flipkart will be hosting its Big Shopping Days sale from May 13 till May 16 and has revealed some of the discounts and offers, which will be available during the sale. During the sale, the online retailer will be offering smartphones, laptops, audio devices and many other gadgets at discounted prices. On all eligible devices, Customers using an HDFC card will be able to avail a 10 percent instant discount and there will be some “Easy Instalment Options” as well like Buy Now Pay Later, Cardless Credit, Debit Card EMI and No Cost EMI. There will also be some contests like free shopping days, where customers need to answer a question and top thousand entries will win 100 percent cashback, along with a "Bid low and win" contest, which starts tomorrow. Flipkart has teased a considerable price drop offer for the Google Pixel 2 smartphones, along with the Samsung Galaxy On Nxt. The Pixel 2 smartphones will be available starting at Rs 34,999, whereas the Galaxy On Nxt will be available for purchase for Rs 10,900. There will be some other offers on phones, which will be unveiled later, says Flipkart. The e-commerce platform will be offering up to Rs 37,000 off on gaming laptops from brands like Acer, Asus and Lenovo. In the laptop category, one will get to avail up to Rs 5,000 off on Core i3 powered laptops and up to Rs 4,000 off on laptops powered by Core i5. Gaming consoles from Microsoft and Sony will also be available at discounted prices. Headphones will be available with up to 50 to 75 percent discounts and wireless soundbars will be available starting from Rs 9,999. The 64GB iPad Pro, Google Chromecast and the newly launched Google Home will also be available at a lowered price, along with power banks, which will be available starting as low as Rs 499. Flipkart will also be launching some exclusive devices and will also list some wearables like the Apple Watch Series 3, Misfit Vapor, and the Mi Band 2 at lowered prices.